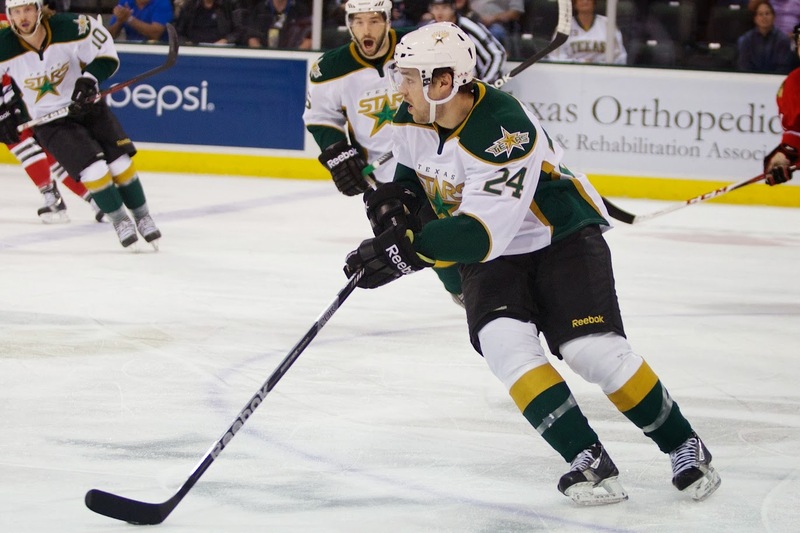 The Texas Stars opened training camp Wednesday in Cedar Park with a double practice day. Players reported last night and had practice sessions on the ice today at 10 AM and 2 PM. 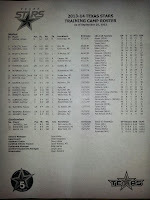 Texas had a total of 23 players in camp by the end of the day, including three goalies, seven defensemen and thirteen forwards. 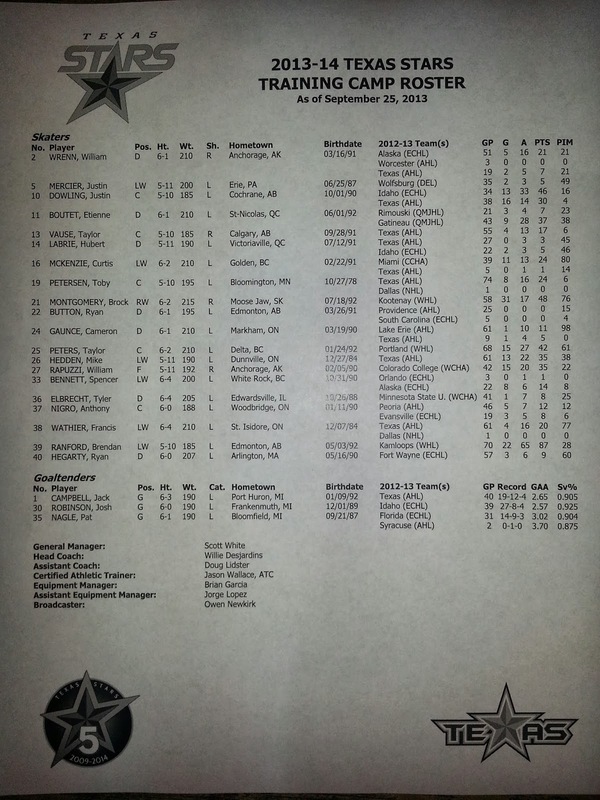 Defenseman Cameron Gaunce was in Cedar Park in the morning but not in morning practice as he had yet to clear waivers. He cleared waivers at 11 AM and was in the afternoon practice. I was unable to make it out to morning practice, but both were run in a similar fashion. It's tough to judge a lot when you are watching drills. The competitive aspect of the scrimmage definitely gave more clarity. "You can't totally judge a player in practice," added Coach Desjardins. "You find out where guys are in games." The second practice had an extended scrimmage at the end, which ended in a 1-0 score in a sudden-death 3-on-3 OT. Brendan Ranford was the goal scorer for the white team. Justin Dowling went to Philadelphia's NHL camp with Ranford several years ago and described him as 'shifty' and having a great shot. Doug Lidster had his winning team pose for a fake 'championship pose' photo while Desjardins' team did a 'punishment' lap of the ice. Among names you might know, William Wrenn had a lot of physical play, knocking the net off its moorings twice by shoving a player into it. Taylor Vause showed he hadn't lost any of his trademark speed over the summer, but he couldn't get his breakaways to sit flat on the ice. Jack Campbell got a break in the afternoon session while Pat Nagle and Josh Robinson manned the pipes. Among tryout players, Justin Mercier (That's 'mur-seer'; it's not French) had a few shots that made me take notice. He isn't on contract anywhere and played in Germany last year. William Rapuzzi looked good, but that's partly because he was lined up with Mike Hedden and Justin Dowling, who had a good chemistry last year. "We always look for the same things," said Desjardins. "Guys who play with tempo and are hungry and ready to come to the rink. We don't want guys who are comfortable or satisfied." Idaho Steelheads head coach Brad Ralph added that he liked what he saw out of the tryout players in camp signed to Idaho. "Based on what I saw, they can all play at this level. If they do come down to Idaho, I am going to be very excited to have them." You'll notice that Toby Petersen is on defense. Coach Desjardins says he tends to do that with centers when the defensive numbers are odd. "We use guys on the point in the power play sometimes and sometimes you get caught or maybe we want to go with a forward on 4 on 4," said Desjardins. "It's something I've always done with an extra D. Most of the time I throw a centerman back there. It gives them extra work low in the zone." It was just one practice in Texas, but Justin Dowling and Curtis McKenzie were both in Dallas camp with Willie Desjardins over the past week. Desjardins felt that both of them had put in significant work over the summer to improve their game and really "stepped it up" in camp. Texas will have only one practice tomorrow, a morning skate. It will be their last full practice before their first preseason game on Friday against Oklahoma City.